The Templers Boutique Hotel is located in the heart of Haifa’s German Colony, and overlooks the Baha’i Gardens. It offers luxurious, individually decorated rooms with air conditioning. Free Wi-Fi and a flat-screen TV is provided in each room, while some feature a balcony, spa bath or whirlpool bath and a kitchenette. The rooms are all individually decorated in different styles. Breakfast is served at a café near the hotel. A kosher option is also available at the hotel, upon request. 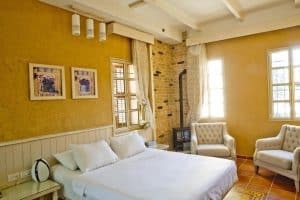 This Boutique Hotel Templers is set in a historic building of 1872, prized within the colony for its excellent renovation work.